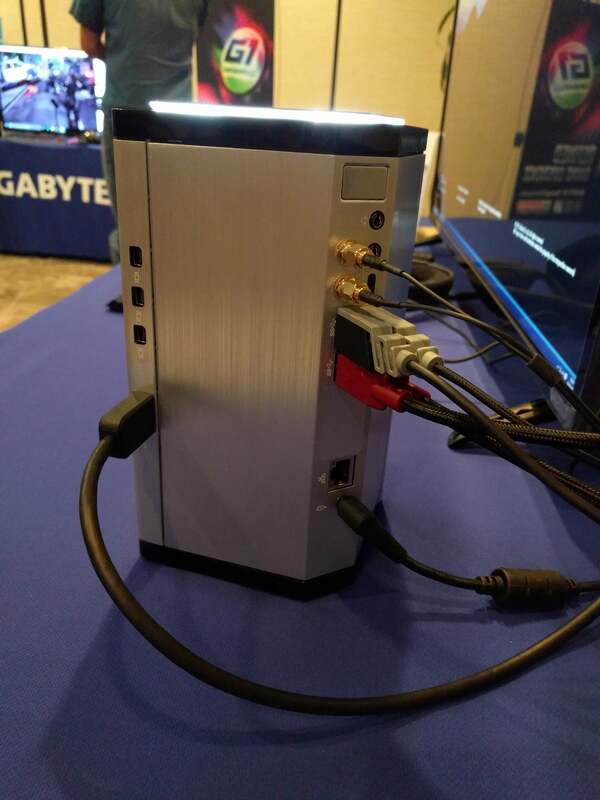 The Brix Gaming UHD is a redesigned version of the 4 x 4 inch machines that offered either Nvidia or AMD discrete graphics, as well as the option of a quad-core processor. Instead of the squat, square form of other Brix models, the Brix Gaming UHD is more than double the height, measuring 8.66 x 4.33 x 4.33 inches. It also eschews plain black, neon green, and bright red for a sleek silver. 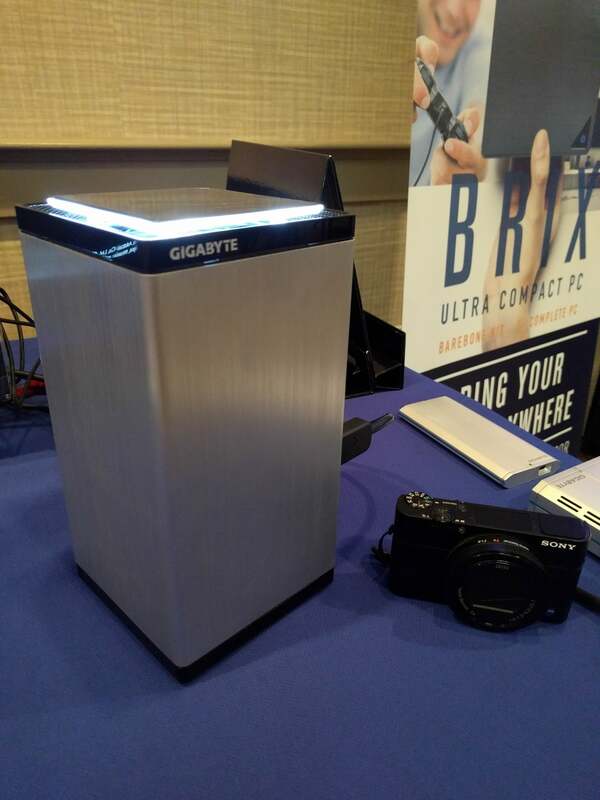 Gigabyte says this machine’s changed look is a result of complaints made about the original Brix Gaming systems’ noisy fans—the new design provides more air flow and reduces the need for high fan speeds. The Brix Gaming UHD side-by-side with a Sony RX100 camera for scale. Inside is an Nvidia GeForce GTX 950 GPU, the choice of either a 2.3GHz Core i5-6300HQ or 2.6GHz Core i7-6700HQ quad-core mobile processor, two DDR4 SO-DIMM slots supporting up to 32GB of 2133MHz RAM, two M.2 PCIe slots, and an Intel Wireless-AC 8260 card for dual-band 2x2 Wi-Fi 802.11ac and Bluetooth 4.2. Gigabyte explicitly stated that this version of the GTX 950 is a desktop part, but indicated that due to size constraints, this GPU won’t have the same performance as a full desktop video card. No specific performance estimates were given, however. The company also noted that the development of this particular Brix system has been underway for some time, hence the use of a GTX 950 despite the recent launch of the GTX 10-series. When questioned, Gigabyte said that discussions are under way for using “next-generation” Nvidia GPUs in a Brix. The “UHD” part of this new Brix’s name comes from its ability to drive four 4K UHD displays at once—driving displays (at, say, convention booths) and signage is the other use that Gigabyte envisions for this machine. Ports include three mini-DisplayPort connections and one HDMI 2.0, separate headphone and microphone jacks, gigabit ethernet, two USB 3.0 Type A, one USB 3.1 Type A, one USB 3.1 Type C, and a Kensington lock slot. The sleek styling of the Brix Gaming UHD doesn’t come cheap: Gigabyte quoted a starting price of $1,300 for an entry-level prebuilt version. That’s a few hundred more than Intel’s target mark of $1,000 for a fully outfitted Skull Canyon NUC; without any performance estimates, it remains to be seen just how much more performance you’ll get with the Brix Gaming UHD’s discrete graphics over the Skull Canyon’s integrated Iris Pro graphics. 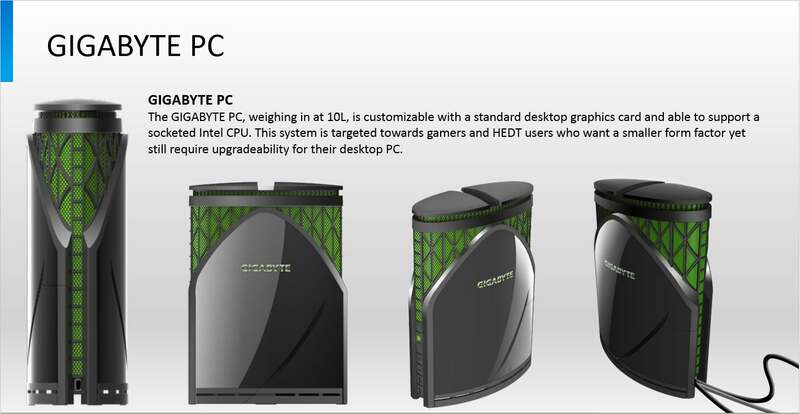 Gigabyte also gave a release date for the equally gaming-friendly Gigabyte PC, which the company had also revealed at this year’s Computex. Slated for a launch in late summer, this system is a larger, 10-liter machine that supports a socketed processor and a full-length graphics card. 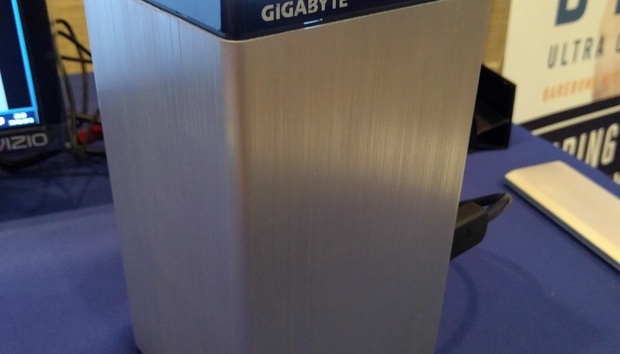 (When asked about actual card lengths supported, a Gigabyte spokesperson said an Nvidia GTX 980 should fit.) Gigabyte says the focus for this system will be prebuilt configurations, which will depend on region and retailer. Pricing will start at $1,500 for entry-level systems, and will feature current components. « Bottom line: Should you install the public beta of iOS 10?